Making a boring segment exciting again in hard work. The minivan used to be the darling of the automotive world. And though that lasted a while, the honeymoon is over. Relegated to families or small business that have to have something roomy and easily accessible, the minivan languished in mediocrity, and the sales reflected that. Buyers quickly turned to crossovers that had more style, more excitement and better fuel economy, despite lacking the overall practicality of minivans. The new Pacifica steals the name from the bloated an forgettable crossover/wagon from the early 2000s and takes over the Chrysler minivan mantle from the now defunct Town & Country. The new Pacifica is pretty much more of everything, and Chrysler is getting behind it with all they've got, even introducing a plug-in hybrid model that's brand stinkin' new for the minivan segment and honestly long overdue. We drove the mid-level trim Pacifica Touring-L and came away with some very strong impressions. 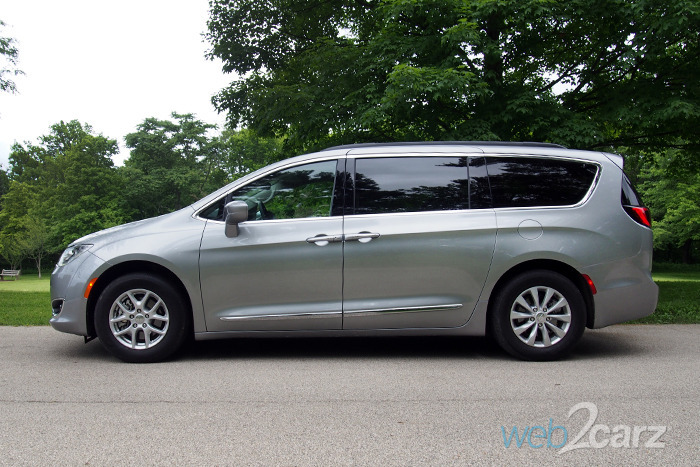 Driving Impressions No one will ever accuse minivans of being exciting to drive, but Chrysler has done a masterful job of making the new Pacifica a good minivan to helm. The engine is robust and gives the Pacifica not just solid acceleration but a great engine note that's actually great to listen to, thanks to the 3.6-liter Pentastar V6. The Pacifica also manages to handle its heft (4,330 lbs) well because of the strut setup in the front suspension and the rear trailing-arm setup that uses two connected main bushings. The Pacifica might not be a lightweight, but it is 250-lbs lighter than the van it replaces. Ride Quality: One of the Pacifica's strong suits. The van is impeccable when it comes to ride quality. It's like a limo without the rich image. Steering: The electronically-assisted rack-and-pinion system provides decent input but doesn't change the minivan steering game drastically. Acceleration: A bit of improvement in the throttle response would be welcomed, but the power is strong overall in most circumstances. On ramps and passing are generally no problem. Braking: Good, progressive braking for something this big. 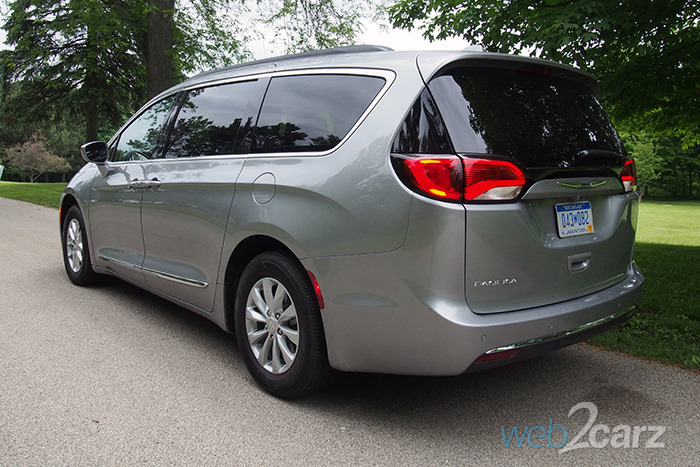 Handling: The Pacifica handles turns decently, but don't try nailing an apex with a full load of kids and groceries. It's still a big car. Technology and Safety The big infotainment screen is one of the best aspects of the Pacifica. It's easy to read, handsome to look at and simple to use. Honestly, we're not sure why manufacturers can't do it as well as Chrysler. We found the Uconnect system a pleasure to use in everyday driving, and passengers were drawn to the screen's easy visibility and big, clear font. Our Touring-L trim was festooned with plenty of safety tech that's more than appropriate for a family-focused vehicle. Owners will rest assured that equipment like blind spot and cross-path detection comes standard on the Touring-L as well as that all-important backup camera. There are airbags everywhere in this thing, and the remote start, power liftgate and rear-park assist are spot-on. Infotainment Screen Size/Quality: The 8.4-inch screen is one of the best out there. It might be a fingerprint magnet, but it's easy to read in the brightest of conditions. Everything is responsive and pretty intuitive, too. Bluetooth Phone Pairing: No issues here. Easy pairing for iOS and Android devices. Re-pairing upon entry was seamless. Voice/Sound Quality: Voice call quality was excellent, and the upgraded sound system proved powerful and clear. Controls: Controls were easy and accessible. 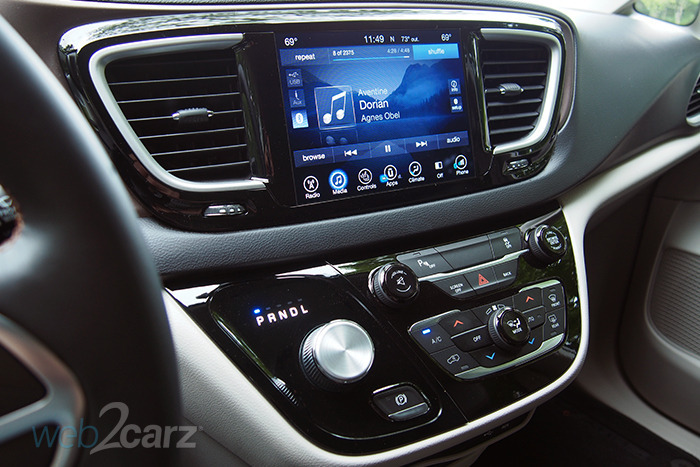 We like the rotary shift knob but dislike its location close to the audio controls. Safety: Standard safety equipment for the Pacifica includes traction and stability control, antilock disc brakes, side curtain airbags, front seat side airbags, driver and front passenger knee airbags and a rearview camera. The antilock brake system also includes automatic brake rotor drying during wet conditions. The rearview camera will trigger low speed braking if an object is sensed and the driver takes no action. Wowee. Exterior Design & Styling You can't exactly drastically change the overall shape of a minivan and keep the functionality. It's just not an option. So, what's a designer to do when faced with this obstacle? Well, you style the hell out of it without losing your customer base, which is no easy task. The Pacifica makes it work thanks to plenty of body sculpting, a stylish fascia and even a tail section that helps reduce its overall visual heft. It's a minivan, alright, but it's a good looking vehicle. Just keep away from the lighter colors than tend to make it look a bit geriatric. Front: Contrary to the current design trend of extreme angularity in car fascias, the Pacifica is refreshing. Curved lines abound in the hood, headlights and grille, and the neat 'Mobius strip' style lower fascia treatment is fantastic. There is, however, still too much chrome for our tastes. Rear: Chrysler did this nicely with black trim that's actually part of the D-pillar that serves to reduce the overall visual size of the rear. 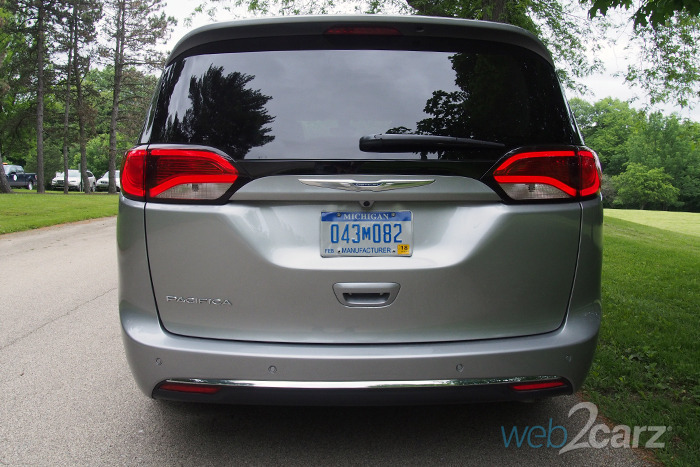 The taillights and simple styling make the van elegant. Profile: This exercise in restraint is brilliant. A simple crease that extends nearly the full length of the minivan drops down toward the tail end. Fantastic. The sliding door track that's hidden below the rear window is genius and keeps the profile clean. We just wish the 17-inch wheels on the Touring-L were bigger. One word: upgrade. 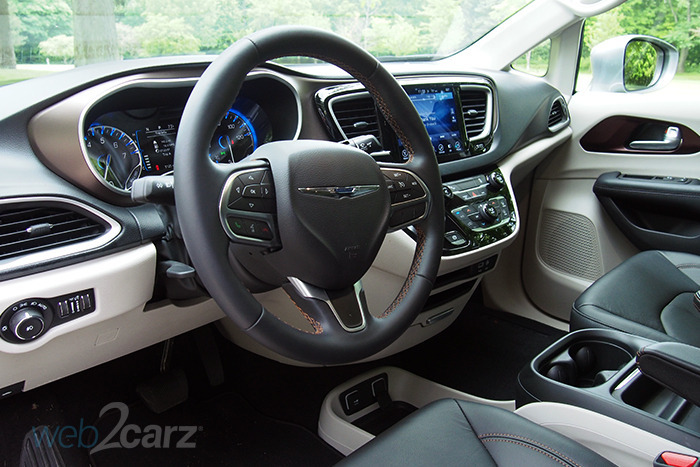 Driver and Passenger Comfort Even more of a standout than the Pacifica's exterior is the cabin. It's simply the best laid-out, best functioning minivan interior on the planet, even outdoing the stop-notch Toyota Sienna, and that's saying something. The seats are very comfortable in all positions, and visbility is great. The mid-level Touring-L adds on oodles of convenience for all, including a power liftgate, automatic climate control (three-zone), leather seats, heated front seats, a heated steering wheel and added storage for the first-row floor console. Front Seats: Chrysler knew these would have to be good, and they came through. Nice leather, good support and just the right amount of cushioning. No hard seats for this family chariot. Rear Seats: 2nd and 3rd row Stow'n Go seating is brilliant. It all folds into the floor for maximum space and convenience. Visibility: Visibility all around is excellent, bolstered by the rear-view camera. Storage and Cargo Room You can't have a minivan, even a crappy one, that has a lack of storage and Cargo room. The Pacifica is the winner in the segment of making the best use of space from tip to toe. The floor storage system is big and deep (despite being hard to reach) and holds more than you can toss at it. The formula is magic because the inside feel spacious even with all the convenient storage options. The center armrest has a nice retracting door with big cupholders, the door pockets are ample, and passengers lack for nothing in terms of space. Storage: Plenty of places to keep gear and electronics. The brilliant move is reducing the center console to make way for a really big storage section between the seats. Just massive. 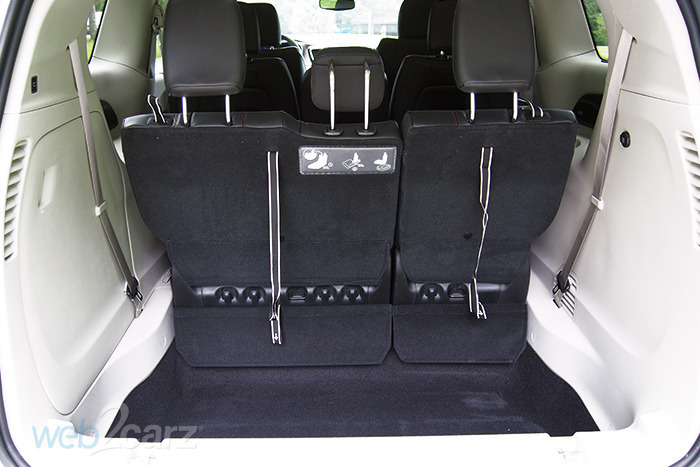 Trunk/Cargo Room: Not only is it huge, the Stow'n Go seats make it a cinch. Drop the seats in the floor and open up enough room to house furniture or the occasional emergency sleep quarters when no hotel can be found. Final Impressions It's hard to get excited about minivans anymore, but the Pacifica makes the best case for the envy of the family-ridden neighborhood. Chrysler can't re-write the book on minivans, but they did their homework and came out with a winner. Those customers either craving one or accepting their fate can turn to the Pacifica for a supremely practical, comfortable and even attractive choice. This is the one van that keeps the segment alive, and we hope that other manufacturers (like Honda with their impending new Odyssey) follow suit. 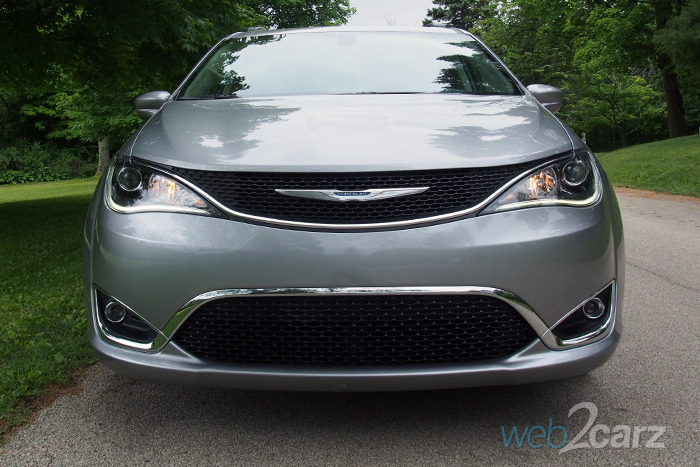 It's obvious that Chrysler was not going to just make small changes, and the result is an excellent one. Every family who is considering going the minivan route should put the Pacifica at the top of their list. Standard Features: Advanced multistage front airbags, driver inflatable knee-bolster airbag, passenger inflatable knee-bolster airbag, supplemental side-curtain airbags in all rows, supplemental front seat mounted side airbags, LATCH ready child seat anchor system, ParkView rear backup camera, blind spot and cross path detection, ParkSense rear park assist with stop, remote start system, security alarm, Sentry Key theft deterrent system, remote proximity keyless entry, keyless Enter-N-Go, electronic stability control, Rainy Day braking, Ready Alert braking, hill start assist, capless fuel filler, active grille shutters, tire inflator kit, active noise cancellation, 2nd and 3rd row Stow'n Go seats, Driver Seat Stow'n Assist, power8-way driver seat, power 4-way driver lumbar adjust, heated front seats, Uconnect 5.0, 8 speakers, SiriusXM satellite radio with 2-year radio subscription, USB media hub, steering wheel mounted audio controls, second-row power windows, 2nd and 3rd row window shades, 3-zone auto control front/rear air conditioning, 17-inch x 7.0-inch aluminum wheels, 235/65R17 all-season tires, automatic headlamps, power liftgate, power sliding doors, premium fog lamps, LED taillamps, power heated fold-away mirrors.